The inky black sky was sugared with stars as Anya walked along a side road in Durrow. She liked nights like this when the new moon allowed the true brilliance of the sky to sparkle like tiny adamants were tossed by the handful into the air. She was taking a risk, she thought, going to him in the night. She wasn’t naive enough to think he spent them alone. But she missed Morty’s smile. His voice. The scent of his roses. It was midday and she stood looking out over yellow plains that stretched into rolling hills. The sun was brutally hot; it was midsummer and the men would be expecting the arrival of the shipment from the west as payment for the armour the fortress sent to the young settlements trying to gain a foothold as they fought over the invisible borders that ran through the Lone-lands. Rhudaur had an advantage, and though some were jostling for a temporary peace with Cardolan, Amon Sul would never find peace. Not while the palantir sat at the top of the hill and not while the Witch-king kept his heavy hand in the land. The elders grumbled among themselves as they crossed the courtyard. They were always grumbling to themselves these days. They disliked the tower being occupied by the dark sorcerer and did their best to keep the people away. She found him fascinating, however. He wore a robe made from the skin of a great crimson long-worm that he claimed he slaughtered in Angmar. If he ever left the tower, he carried a gnarled grey staff topped with sickly green jewels. She wondered how much truth existed in the rumours of his power and dreamed of learning his secrets. She turned and walked down the narrow stone steps. Glancing into a rain barrel, she pulled at the corner of her sharp blue eye stretching the skin smooth. Sighing heavily, she frowned. Then, without looking up, she turned and ran into the solid mass of a man. She looked up into eyes as blue as the sapphire stones the Dwarves brought from the mountains far away. Her breath caught and her heart stopped beating. She realized her hands had grabbed hold of him in their frantic flailing and she felt his muscles flex as he steadied her and stepped back. Aeron. He was dressed in hunting leathers instead of his metal breastplate. His arms were bare and he wore an easy smile. She had never looked at him so closely before. He was just a solider, after all. Nothing new or exciting there. Except… the way his head tilted as he regarded her. And the set of his lips as they curved into that amused smile. Her heart didn’t start beating again. It took off at a gallop and leapt into her throat. When Anya awoke, every bone in her body ached with damp and cold. The sharp pain in her ankle still throbbed and brought her quickly to her senses. Tears began to flow before she even tried to push herself up from the ground. What happened? she thought as the looked up and found the Sickle high in the sky. Several hours had passed since she left for Morty’s little home on the edge of the graveyard. High above was still an inky black. Clouds had moved in blotting out the stars and for a moment, she didn’t know where she was. The Lone-lands. She never wanted to go back. Was it a dream? It felt so real. Aeron. She saw Aeron young and alive and suddenly she missed him dreadfully. It ate away at her and made her want to bawl for want of him. The confusion that sprung up in her mind conflicted with the certainty in her heart. Why would she feel like a limb was missing? Like she’d never see sunshine again? She must have been seeing the world through Faethril’s eyes. She shuddered at the thought. Slowly, she pulled herself to her feet and tested her swollen ankle. She looked around and regained her bearings; she was at the gate near Ravenhold. Her own home was closer than Morty’s. She tried her best to keep her weight off her tender ankle as she slowly hobbled home still pondering the dream. 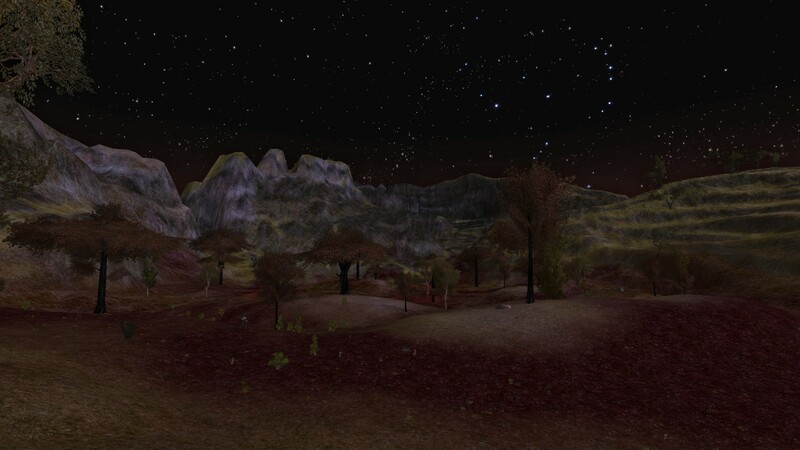 A low fog descended upon the brown lands surrounding the Eglain stronghold of Ost Guruth. The clouds hung dark as coal as they covered the grounds, stifling torches not a few feet away to faint glows like fireflies across a field. From the red pools to the east, a crimson mist rose and the norbog screamed with excited chatter. The wargs retreated from the open fields and orc and goblin trembled in their camps. 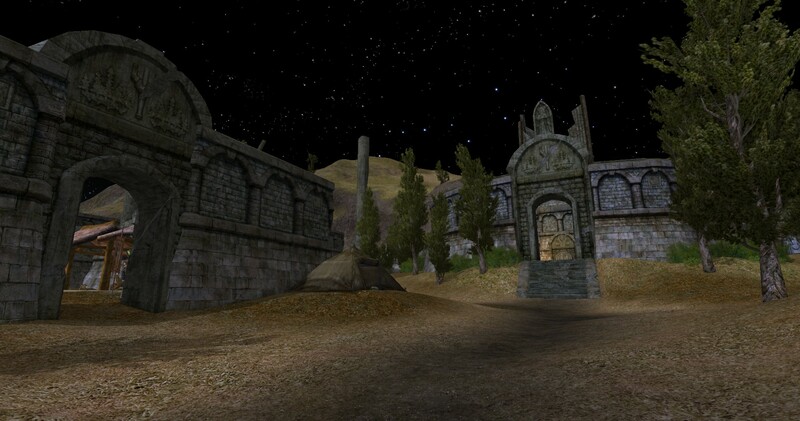 The mist rose over the stone walls of Ost Guruth. With creeping fingers, it clawed its way over the cobblestone paths seeking. . . seeking the prone form half-wrapped in a bedroll with her head resting in the pillow of her lover’s arm. Creeping across ankles, slithering beneath the heavy fog, the mist found a bare foot. . . an ankle. . . a milky calf. . . a hand. . . a neck. . . two parted lips. . .
For a brief moment, it swirled about her mouth. Tendrils of blood-red dipped into her nose, seeking entrance. As she took a breath, the mist delved between the rosy lips and filled her lungs with its malice. Her very blood served as the conduit to the physical world. . .
Eirikr Tenorbekk stood at the junction between the road and the path leading up to Eruviel’s front door. He looked up toward the house as its owner came down the path. He could see the tops of the statues and the shingles on the roof. The comfy little hammock, the friendly firepit, and Anya’s rose bush were hidden by the slope down to Fountain Street. “Eruviel,” he said neutrally as she reached the street. Eruviel offered Eirikr a curt nod as she stepped past her front gate. “Eirikr. Are you ready to depart?” The Elf wore her armour with ease and Eirikr could not help but notice how well it suited her out of the corner of his eye. He continued to stare at the roof of the house for a long moment before nodding. “You said that Anya has chosen to live with that man who is courting her?” He tried to keep the concern from his tone. Eirikr leveled his eyes with her face. “You trust him? He was quick to offer this ‘spare room’ to my sister. He is honorable in battle, but is he honorable in matters of the heart?” Deep in his mind, he knew he was being foolish since his sister already left for Ered Luin the day before. She smiled slightly, nodding in agreement. “Yes, let us depart.” He turned and mounted the steed behind him taking a moment to adjust his saddlebags. His weapons, aside from his bow, were arranged within their scabbards on the horse. 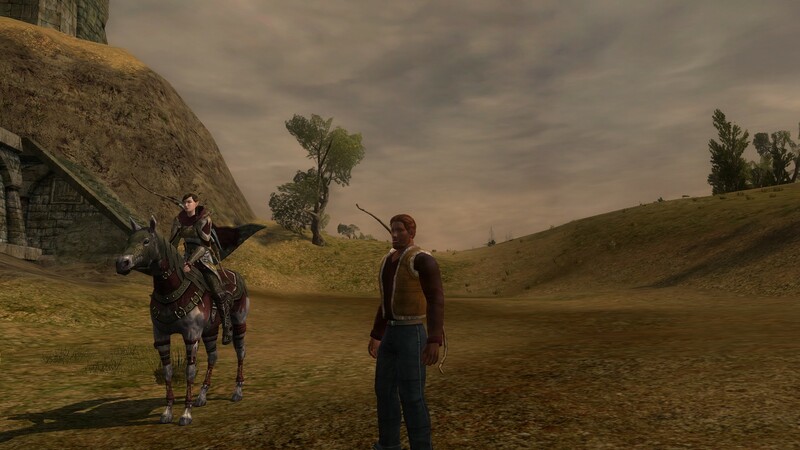 He looked over as Eruviel stepped up into her own saddle, her horse patiently bearing three medium saddle bags and two spare quivers stuffed full of arrows. Eirikr shook his head. “There will be no easy leg of our journey. We ride.” His mount reared as he thundered off down the road. Again, they rode in silence until the tall walls of Ost Guruth loomed above them. Only as they turned from the road to take the well-worn path to the stable did they slow. He sighed as he ran his hand through his hair. 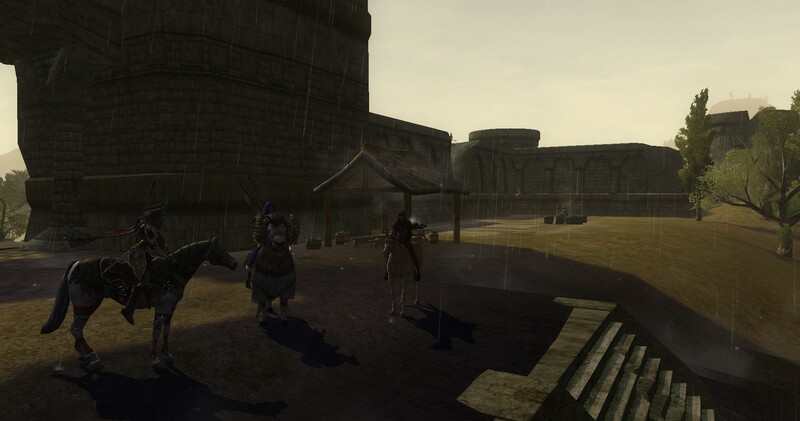 “We camp here for the night.” He slid down from his horse and handed the reins to the stable-master with a nod. Eruviel arched a brow at Eirikr but merely bobbed her head at him. “Let us go, then.” Pulling a saddle bag from her horse, she smiled back at Unni, the stable-master, before heading towards the steps leading to the fortress. Eirikr grabbed his things and followed, looking around. The old keep was busy with evening preparations. The meal was being served and people were finishing their last tasks before the sun fell too low in the sky. The lithe Elf walked through the camp with an air of familiarity and stopped by the table in the building of healing. Setting her bags on the table, she nodded to Strangsig and muttered quietly. “It has been a long time since I’ve seen so many empty beds.” Shooting a small smile to Eirikr, she turned and headed back outside. Eirikr looked around once more as he followed her out after dropping his own bag onto the floor. “That is a good thing,” he stated as he trotted behind her. 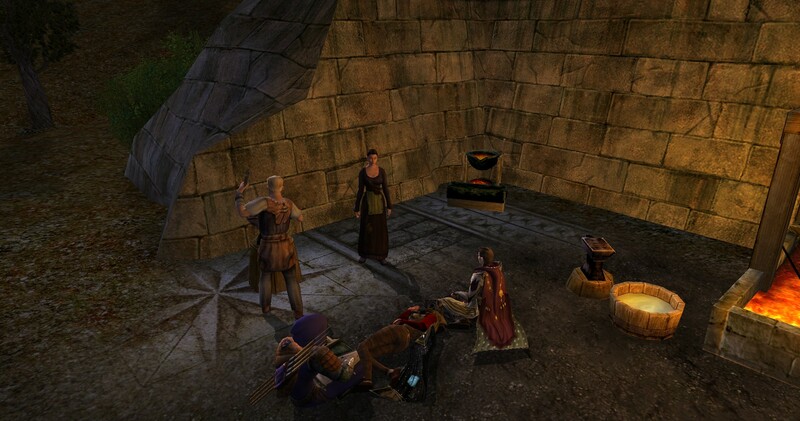 Eruviel bowed to Trumswith who stood behind a cauldron cooking on a fire. “It has been a long time, mellon! Three plates, if you please.” Eirikr raised a brow and silently counted them both: one, two. He remained silent, however, and simply watched the man spoon up the meal. Eruviel offered the first plate of deer meat and some sort of mystery beans to Eirikr, reaching out her other hand to take the second and third. “For the healer. She has a bad habit of forgetting to eat,” she explained simply. Eirikr raised his other brow only briefly and then smiled at her as he took his plate. “It is good of you to think of her,” he said softly. He had not taken much time to get to know Anya’s ‘systir’ on a personal level. Their many nights as a trio were usually spent eating with the women singing or playing games. They often tried to pull him in, but just as often, he resisted. He began to admire her thoughtfulness as she balanced the plates. As she returned to the healers, he wandered about a bit with his plate until he saw the gap in the wall. He headed that way out of sheer curiosity. “Sig,” he heard her call out. 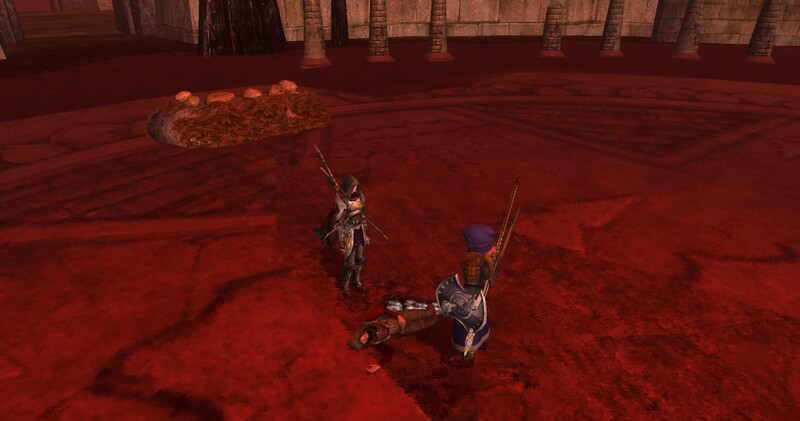 “Dolle naa lost!” As he left the walls of Ost Guruth, he turned briefly to examine the skirmish camp to his right, but then his eyes landed on the reddened land below. He frowned as he stared over the tainted earth. From the healer’s building, he heard the healer’s reply. “Lle holma ve’ edan!” the woman shouted over and there was a barking laugh from both. Eruviel stirred the food absent-mindedly around her plate as her eyes darted around the red valley below, noticing every hidden predator. “I was surprised . . . how relatively easy it was to get through to the outpost. The spirits seemed . . . almost weary. Anric paved the way, unwaivering the several times numerous dead swarmed us. It was not like Fornost at all,” she said grimly. “The red reminded me somewhat of Angmar. It was as if we sloshed through pools of blood. A voice rang out from behind them and Eirikr looked up with a start. An Elf said, ‘Thought I heard voices up here. Good evening to you.’ She bowed deeply before Eruviel. Eirikr turned at the sound of the new voice and shot Eruviel a look. He looked the Elf up and down. Eirikr looked up and swallowed. It figured something like that would interrupt them. He knew the further they got from Bree-lands, the harder it would be to persuade Eruviel from accompanying him. He glanced down at the plate of cold food and picked up a hunk of meat from it with his fingers. He ate it automatically as he looked on the new Elf. Eirikr answered in Sindarin with a smirk, “Travel, of course. You?” His time as a trader in Dale gave him a good understanding of many languages and he was proud of his command of the Elvish tongue. At almost the same moment, Eruviel responded in the same tongue, “The men of Ost Guruth were very kind to offer us shelter. It is good to know there are others who keep watch in these lands.” She arched a brow at her human friend, but mantained her calm demeanor. Eirikr finished the food and finally looked up at the Elf. “How thoughtful.” He tossed the plate aside and turned around to face the Circle of Blood. He jammed the head of his spear into the earth and sank down beside it. 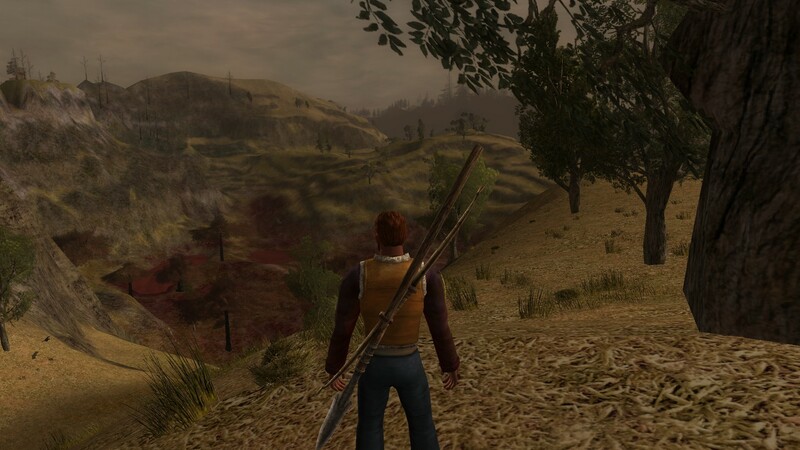 He continued to stare over the land, leaning on the spear. The new Elf glanced quizzically to Eruviel. Eirikr pulled out a fishing hook and some feathers and line. With deft fingers, he began making a lure. Eirikr continued to tie the lure, stifling a yawn. Eruviel chuckled. “I would say that the Adan should be grateful, but I fear it is only a sign that the days continue to darken.” She bowed deeply before her kindred. Eirikr looked at Eru for a moment and nodded. Then he offered to Gilrayen, “Eirikr Tenorbekk of Dale. Pleasure.” He headed back to his bed for the night. As he walked away, he heard Eruviel’s voice brighten as they traded introductions and he sighed heavily. Sinking down onto a bedroll, he stared up at the stone ceiling. He never had that natural ability to connect with someone and he always felt like the facade was too big of a burden. He envied Eruviel’s affable nature. Perhaps if he had such abilities he could have settled into the role of his father’s apprentice and satisfied the man’s need for power and legacy. He rolled over with a grunt. Useless thoughts, he told himself but he continued to stare at the cold stones for a long time before sleep came.